Warning ahead of time... it gets a bit.. um.. collegey in this post. For this Halloween my friends and I decided to go a bigger then just a simple Halloween party. 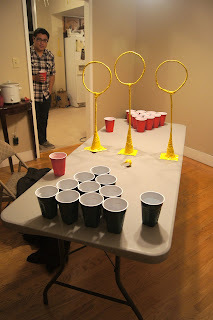 We decided, why not do a Harry Potter Party, and man was it a success. 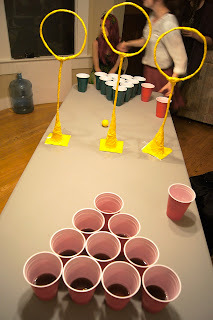 We had apple cider, butter beer, trivia, movies, expelliarmis shots, and of course... Quidditch Pong. 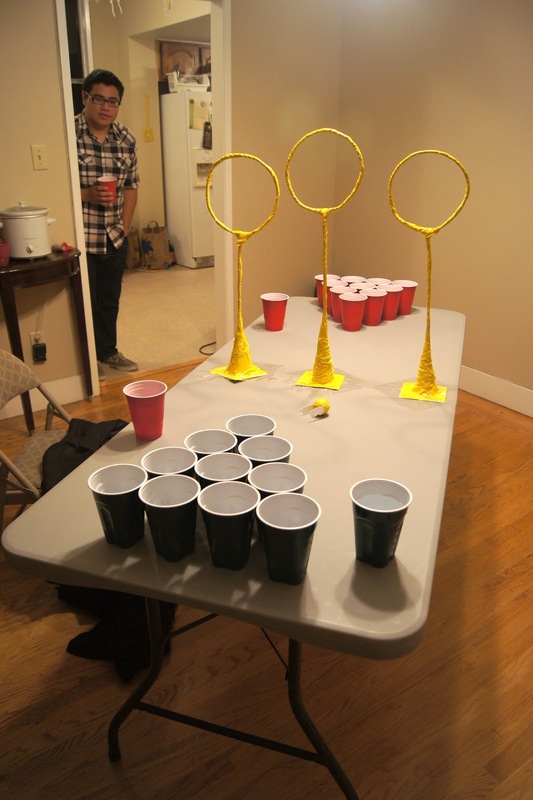 What's Quidditch Pong Louis? Good question, Louis. 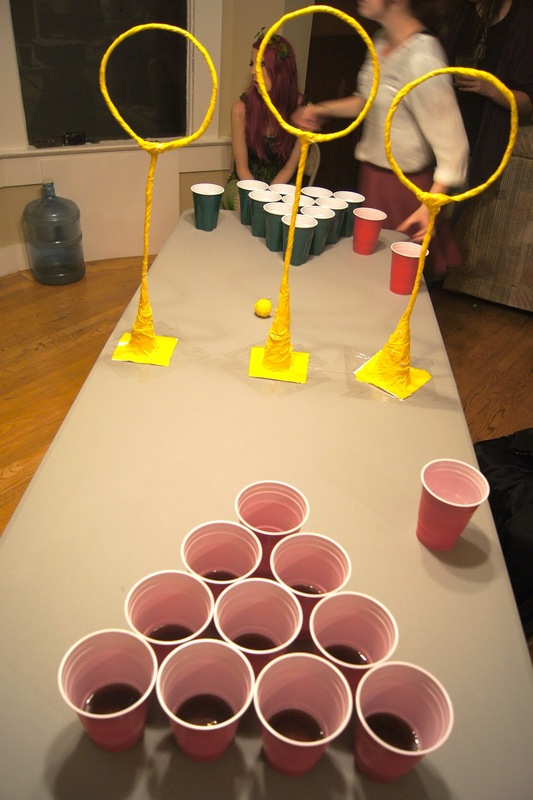 Quidditch Pong is a personal invention that mixes the timely art of beer pong, and the amazing wizard sport Quidditch. First you have to make the hoops. I made mine with hangers and yellow duct tape. Make sure you make them various sizes! Choose what team goes first with your sorting hat! If the quaffle goes through a hoop the enemy team is allowed to use there bludgers (hands) to knock it out of the way. When there is one cup left, the snitch must be used. Trust me, this makes things a lot more difficult. 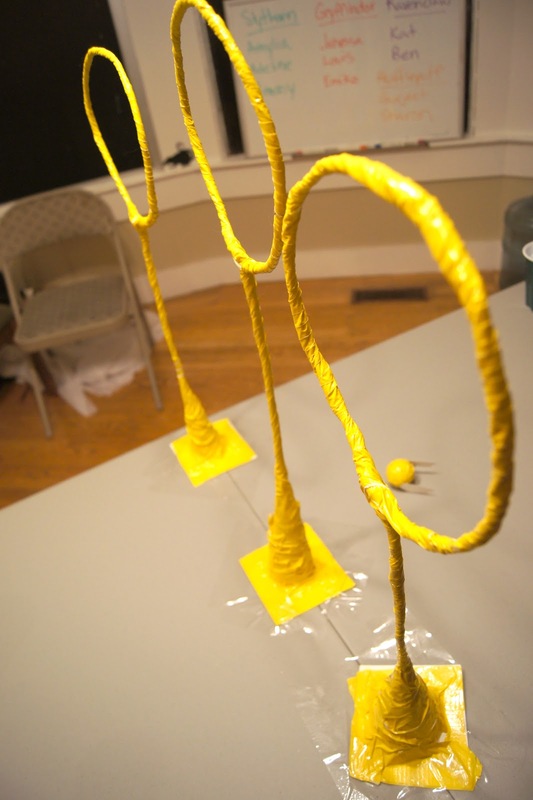 I made my snitch by just wrapping a ball in yellow duct tape and attaching a few wings made out of paper, but you could easily use a yellow ping pong ball with glued on wings. We split the party up into houses to make the game more competitive. The party went awesomely. We'll definitely be doing this next year! This is inspired! I love all the photos too. your blog is very beautifull and happiest!!! Hi, thanks for this wonderful post! awsome tools! Did you use one hanger each for the hoops, or did it take more than that? I'm just trying to figure out how to get them to stand up straight and not look off center. Great blog!